These days, the comments section of any engaging article is almost as necessary a read as the piece itself — if you want to know how insider experts received the article and how those outsiders processed the news (and maybe to enjoy some nasty snark from the trolls). Should this part of every contemporary article be curated and edited, almost like the piece itself? Should it have a name? Should it be formally linked to the original article or summarized at the top? By now, readers understand that the definitive “copy” of any article is no longer the one on paper but the online copy, precisely because it’s the version that’s been read and mauled and annotated by readers. (If a book isn’t read until it’s written in — as I was always told — then maybe an article is not published until it’s been commented upon.) Writers know this already. The print edition of any article is little more than a trophy version, the equivalent of a diploma or certificate of merit — suitable for framing, not much else. Hitt uses the case of the ivory billed woodpecker to explain that authoritative knowledge claims are often subject to scrutiny from those with knowledge and expertise outside the academy. 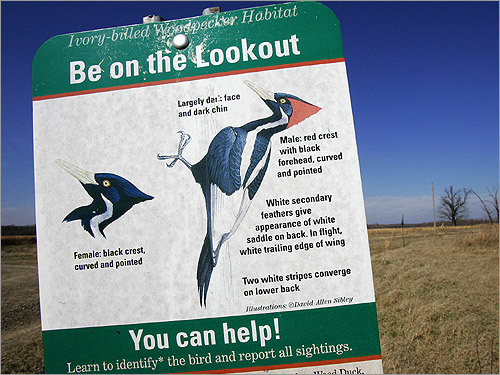 The ivory billed woodpecker was thought to have been seen in a video in 2004 -- the first sighting in more than 50 years. The sighting was subsequently written up and published in Science. It turns out that the sighting was false, it was not an ivory billed woodpecker. The paper in Science however stands uncorrected. Already, among scientists, there is pushback, fear that incorporating critiques outside of professional peer review will open the floodgates to cranks. Not necessarily. The popular rejection last year of the discovery of a microbe that can live on arsenic was mercifully swift precisely because it was executed by online outsiders. Not acknowledging that crowd-checking and amateur commentary have created a different world poses its own dangers. Take the case of the ivory-bill. The article in Science has never been retracted. Cornell still stands by its video. The federal Fish and Wildlife Service acted as though the ivory-bill existed, and, in 2008, it asked for $27 million to support recovery efforts. Here’s the thing: The ivory-billed woodpecker is the Schrödinger’s cat of contemporary media — dead to those who’ve looked inside Tom Nelson’s blog but alive to the professionals who can’t bear to. Some may fear that recognizing the commentary of every article will turn every subject into an endless postmodern discussion. But actually, the opposite is true. Recognizing the gloss allows us to pause in the seemingly unending back and forth of contemporary free speech and free inquiry to say, well, for now, this much is true — the ivory-bill still hasn’t been definitively seen since World War II, climate change is happening and caused by mankind, natural selection is the best description of nature’s creative force. Et cetera. It seems that the greatest challenge associated with blogging and other forms of "gloss" is not one of knowledge claims but of the accountability of authoritative institutions. For instance, various claims made by the IPCC and US government as related to disasters and climate change are widely known to be false and Steve McIntyre has thoroughly documented many instances of questionable scientific practices in the so-called hockey stick literature. In both cases the relevant institutions have so far decided that it is easier to ignore the gloss than to deal with its consequences. But anyone who is paying attention can see what is going on. There is no ivory billed woodpecker. The weirdest part of the ivory-bill’s resurrection is that if you look back through the past four decades, it turns out the bird has come back to life many times before. The ivory-bill seems to rise like a phoenix at times of environmental anxiety. And each time the sighting has been debunked, and then afterward some great section of wilderness has been declared protected and everyone feels better for a while. Nice line. But you have to wonder: if we’d cinched our sense of reality with just a bit more reason instead of mythology, maybe we’d still be seeing the ivory-bill for real. Ignoring the gloss may serve the interests of short-term expediency, but the longer-term consequences may not be so welcomed, especially within those bodies whose assertion of authority rests in knowledge claims.